Charles is listed on the Jacksdale War Memorial as having survived WW1 but was a casualty nonetheless, dying from the effects of gas poisoning in 1921. As his cause of death is directly attributable to his service, we have included him in the list of ‘fallen’. Charles Burton was born in 1883, son of Edgar and Jane Burton of New Westwood, Notts. The 1901 Census lists the family as follows: Edgar (aged 45), Jane (42), Charles (17), Harry (16), Amelia (13), Thomas (11), and Esther (8 months). The 1915 Electoral Roll lists his father as Edgar ‘Smith’ Burton of New Westwood. Charles was an early volunteer, enlisting at Derby on 5th September 1914, at the age of 31. 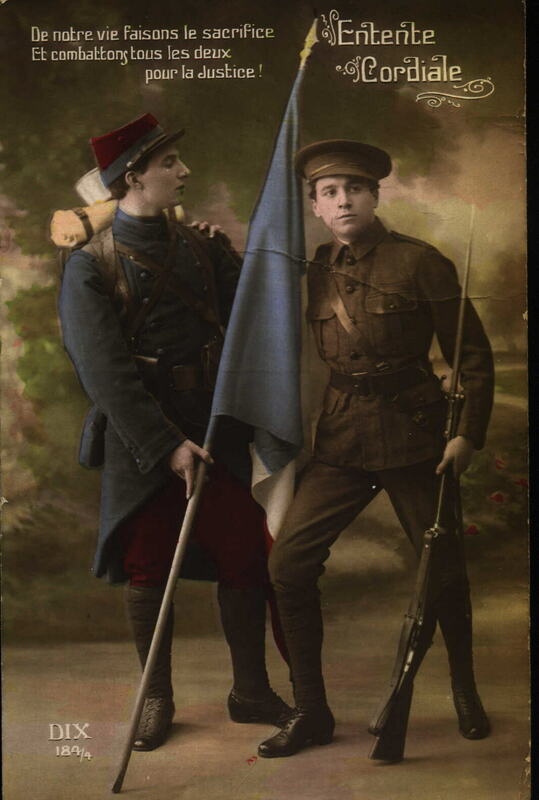 In all, Charles served with the colours for 4 years and 7 days in the 1st and 4th Battalions Sherwood Foresters. He was discharged into the ‘Army Reserve’ on 12th September 1918, probably due to having been gassed. He was eventually discharged from the Army at Litchfield, Staffs on 14th December 1918, one month after the Armistice. Although he had seemingly survived this harsh conflict, tragedy hit the Burton family when, on 29th March 1921, at the age of 37, Charles died (after what must have been a long and painful illness), from the effects of gas poisoning. His discharge papers describe him as being 5ft 6ins tall, of fresh complexion, with brown eyes and brown hair. 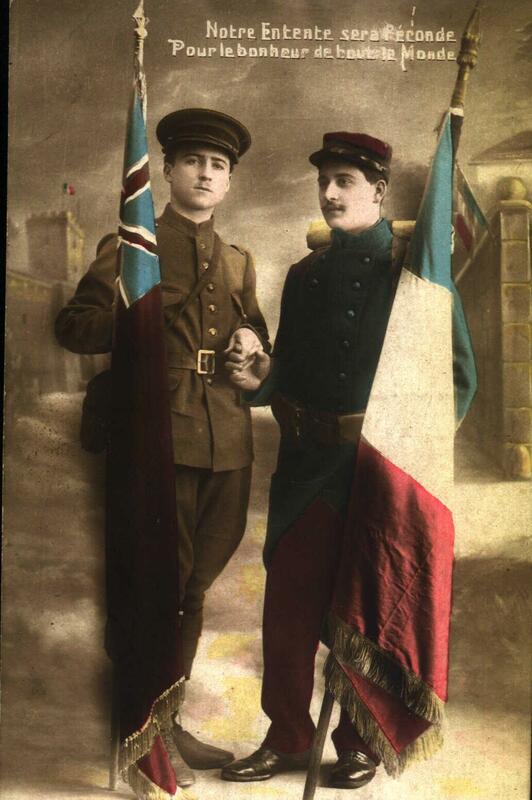 Surviving picture postcards, entitled ‘Entente Cordiale’ show Charles posing with well-documented French models from a famous French photographic studio of the day. Charles was awarded the 1914-15 Star, the British War and Victory Medals and Silver War Badge No 491964. 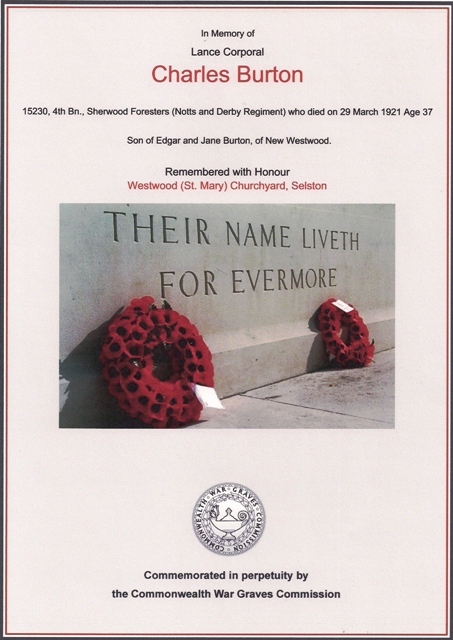 Listed on the Jacksdale Memorial as having ‘served’, he is buried in St Mary’s Churchyard, Westwood, with his parents Edgar & Jane Burton. 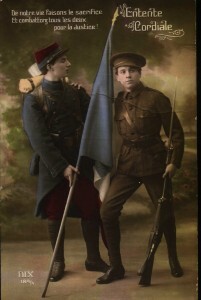 Charles’ Funeral Service card is inscribed “Peace, Perfect Peace – Until the day break and the shadows flee away” The grave also mentions his brother Tom , with an inscription – “Duty Nobly Done”. His younger brother, Thomas Burton, also a Sherwood Forester, was killed in action in September 1916 and is listed on the Jacksdale War Memorial.